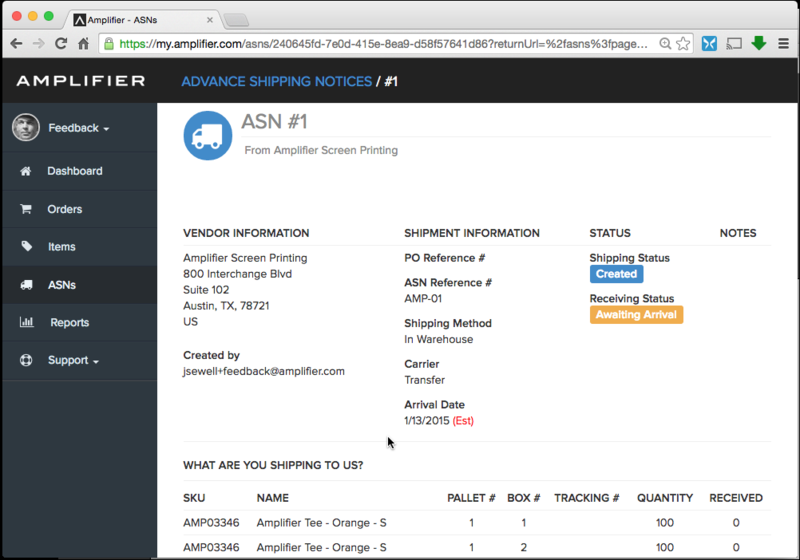 Now that you've created a digital ASN, you're ready to print paperwork and ship us the goods. Once your first ASN has been saved, you will be returned the ASNs page. No longer empty, you will see your first ASN as "ASN #1." SUPPLIER - Which supplier is producing this Inventory? 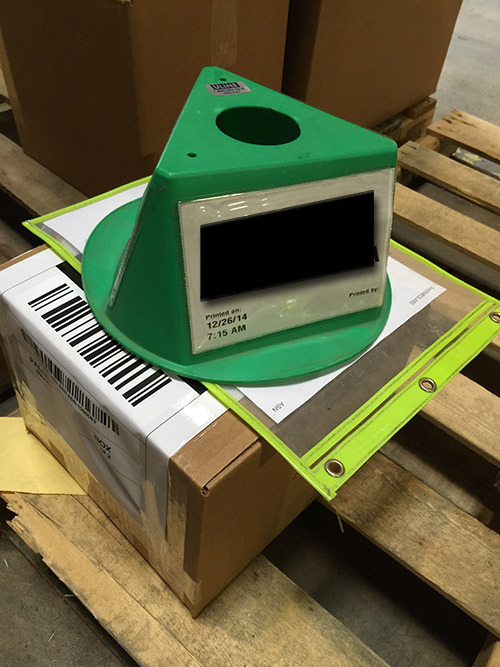 Now it is time to perform the Physical labeling of your boxes and pallets. First, you must click the ASN # to open the finished ASN and generate your paperwork. As you can see, our digital record is exactly the way we created it, only presented in a more efficient format. Scroll down to the bottom of the ASN. 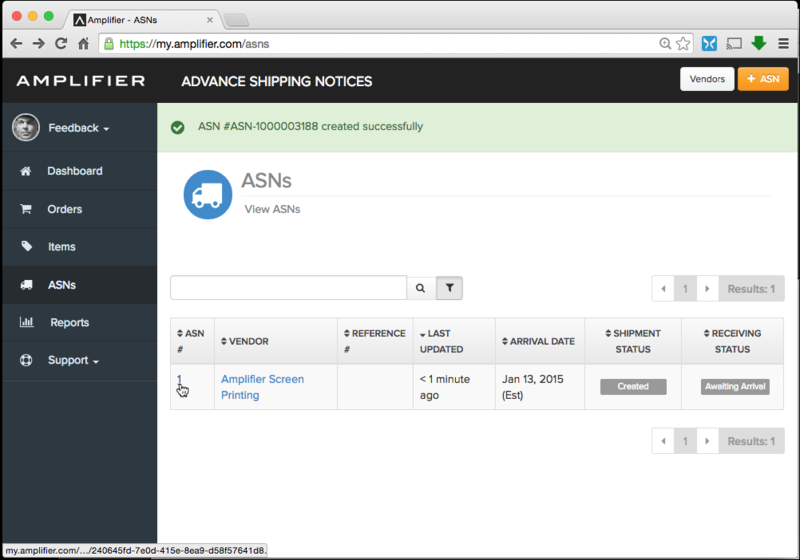 VOID ADVANCED SHIPPING NOTICE - To change an ASN after saving it, void your original then create a new one. 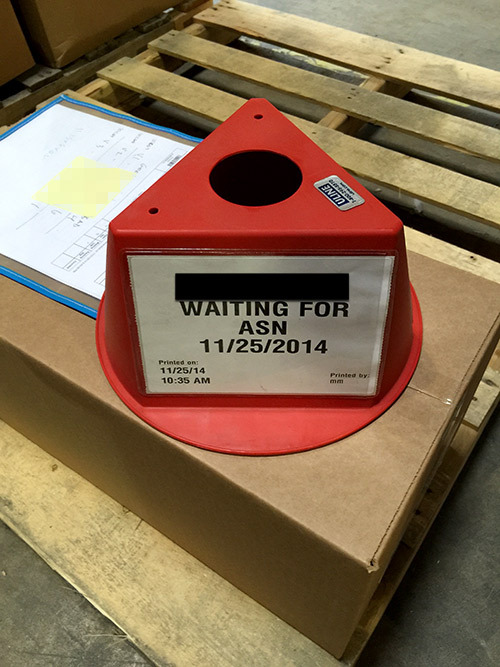 PRINT BOX LABELS - Print individual Box labels for EACH container on the entire shipment. 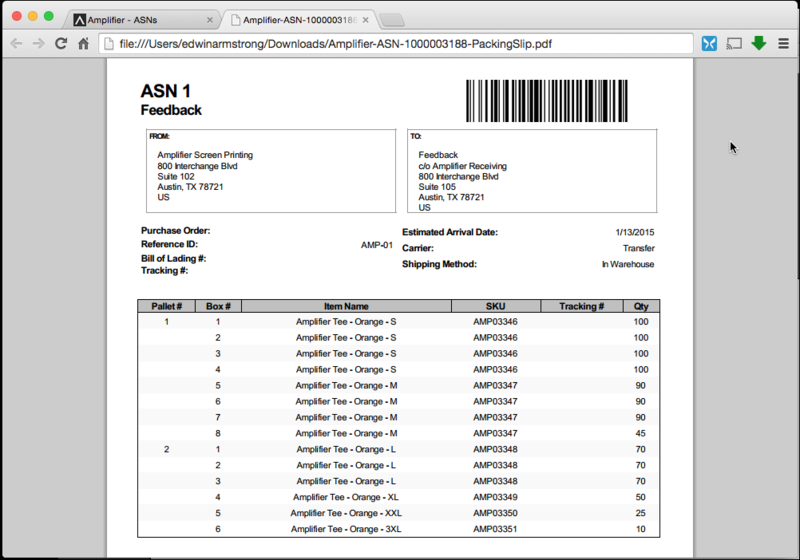 Click "Print Packing Slip" to generate a PDF summary of the ASNs contents. Print this piece of paper. Then affix it in an (ideally) clear sleeve on the outside of BOX #1 of PALLET #1. When your inventory reaches Amplifier, our receiving crew will find this piece of paper and be able to know the contents of the entire shipment. 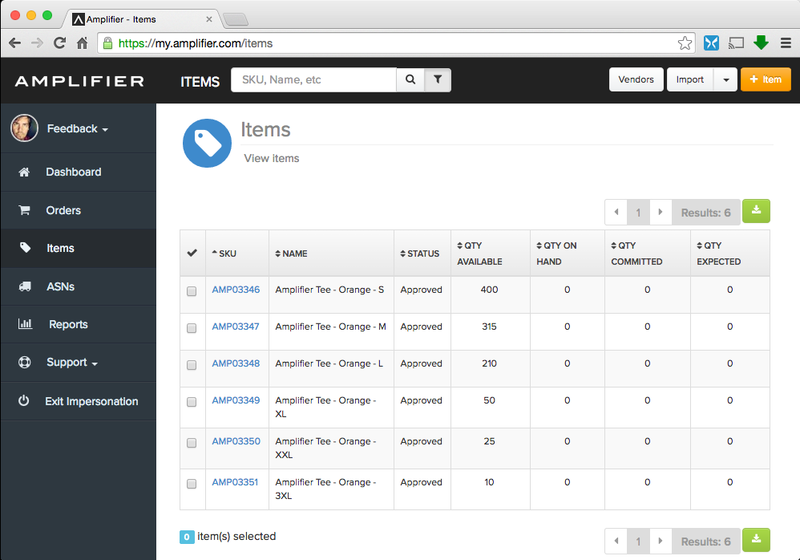 Print each Box Label, and affix it to the corresponding box of inventory. So for Box 1 of Pallet 1, you will need to attach this printout securely to that specific Box. 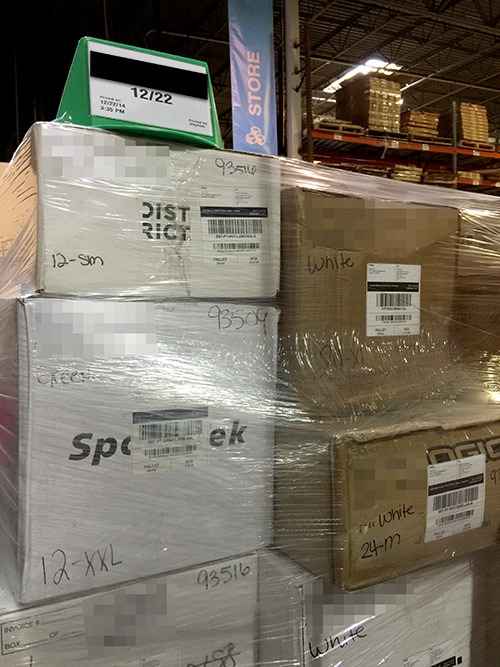 Note that your Box Labels include the SKU, the # of Units in the Box as well as the Pallet #. 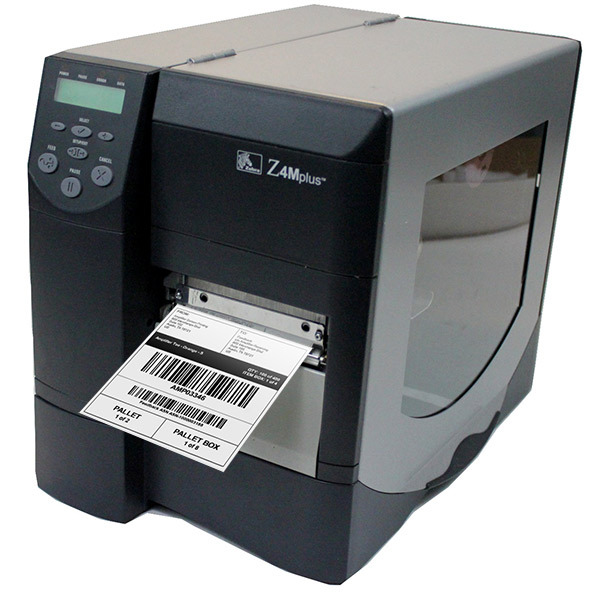 In many cases, suppliers creating ASNs already have Label Printers loaded with 4"x6" adhesive label stock on rolls. ASNs that have been properly created and labelled earn the proud Green Hat. They enjoy the fast lane treatment at our dock and are practically ready to be Put Away. 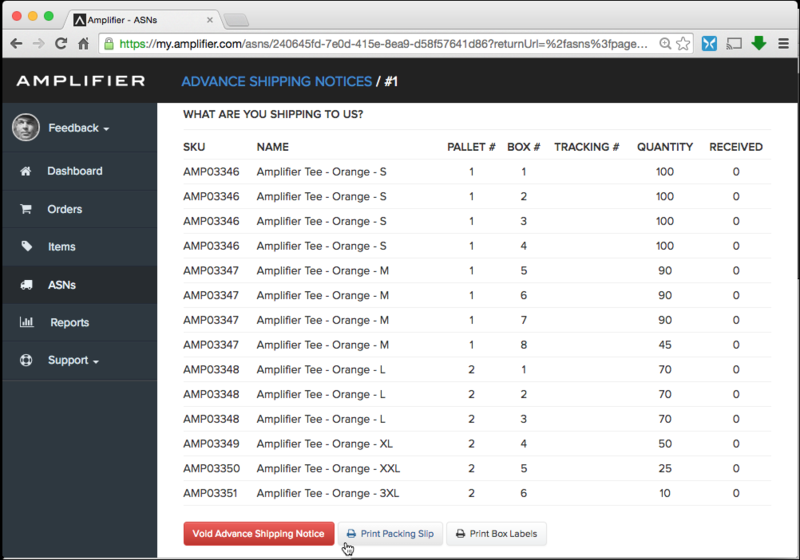 Faster receiving means faster selling, because once your inventory is received you are able to sell it on your online store. 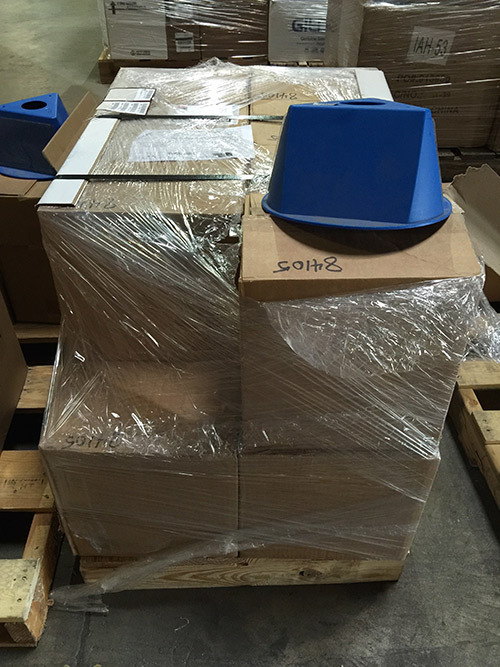 In the image below, you can see a large delivery where all boxes show proper labeling.